Hope you had a wonderful Halloween! You can tell my son was so enthused with me taking so many pictures. 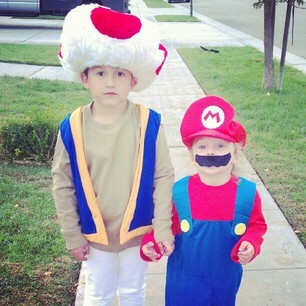 And yes, that little Mario is my daughter. She is so girly so I was surprised that she had her heart set on Mario. She always wanst to be like her big brother. They are best friends. Now onto the real stuff. It's time again to encourage an awesome woman! There are so many awesome women on the web and I love to support them! 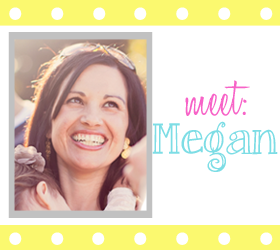 Megan is a beautiful stay at home momma of 2 daughters. Sugar & spice with a hint of extra spicyness! The spicyness comes from her bluntness but you will love it because I do! Her honesty about everyday motherhood cracks me up because I can feel the same exact way. You really need to check out her blog! So head on over to Absolute Mommy and show her som love and follow her! I've been off line all day. Thank you so much! You are so sweet!! We all got to get together for another meet up.